The mountainous ridge that circles the equator on the Saturnian moon Iapetus is both weird and spectacular. Discovered in 2004, the icy rim is as much as 20km high and runs fully 1,600km from end to end. No explanation for its existence has yet won total support; it is a puzzle. Dr Andrew Dombard and colleagues have now made a compelling case for the ridge being the remains of a huge ring of debris that once orbited Iapetus but which eventually fell on to the moon. 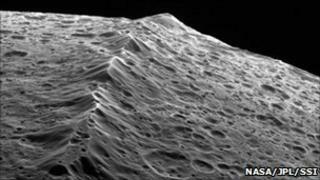 "In my opinion, the ridge at Iapetus, which sits right on the equator, is one of the most amazing features that we've seen in the Solar System," the University of Illinois at Chicago (UIC) scientist told BBC News. "Imagine standing at the base of this ridge. You'd be confronted with a mountain of ice that is taller than the tallest mountain on Earth and nearly as tall as Olympus Mons on Mars, the biggest volcano in the Solar System. "And it runs ram-rod straight off in either direction. You wouldn't see it end; you'd just see the ridge disappear over the horizon." Dr Dombard has been explaining his team's thinking here in San Francisco at the American Geophysical Union (AGU) Fall Meeting, the world's largest annual gathering of Earth and planetary scientists. The ridge was first identified in images of the 1,400km-wide moon acquired by the Cassini probe in 2004. Dr Dombard's group proposes that Iapetus was hit very early in its evolution by another icy body, and that this impact threw an enormous quantity of debris into space. The researchers argue that this material could then have come together to form a mini-moon or sub-satellite. They liken the situation to the one at dwarf planet Pluto which has a small moon called Charon that was also probably the result of a collision. Earth's own Moon was almost certainly made this way, too. But the orbit of the early Iapetus sub-satellite would have decayed over time, the team believes, and tidal forces would have torn it apart to distribute its material in a thick ring around the world. Over a relatively short period of time, this disc would then have collapsed on to Iapetus to form the ridge we see today. "Imagine all of these particles coming down horizontally across the equatorial surface at about 400 meters per second, the speed of a rifle bullet, one after the other, like frozen baseballs," said colleague Professor Bill McKinnon from by Washington University in St Louis. "Particles would impact one by one, over and over again on the equatorial line. At first the debris would have made holes to form a groove that eventually filled up." Many models have been put forward to explain the line of ice mountains, even ones that involve ring collapse. Some researchers have proposed that Iapetus could have changed its shape as it began to spin more slowly after its formation. The stresses from de-spinning, it is said, could have produce warm, buoyant ice in the moon's interior that then rose to the surface at the equator, pushing up its brittle surface to make the ridge. Dr Dombard told BBC News: "Those models generally invoke global to regional stress fields. Yes you can come up with model where the stresses peak right on the equator, but the stresses 20 degrees off or at the poles may be just as large. "And so you would expect to see other features on the satellite - not just one feature right on the equator." Although Iapetus is unique in the Solar System for its ridge, there are hints at another Saturnian moon, Rhea, of perhaps similar processes at work. Images of Rhea reveal a chain of splotches along its equator where fresh, bluish ice has been exposed on older crater rims. One suggestion is that these patches could have been uncovered by orbiting material - perhaps a ring - crashing to the surface in the fairly recent past.